The memorial to the men lost in the skies was constructed after the First World War then after the Second World War, the dates “1939-1945” were etched on its face. It has been moved several times in Nürnberg and is now permanently at the Rally Grounds. 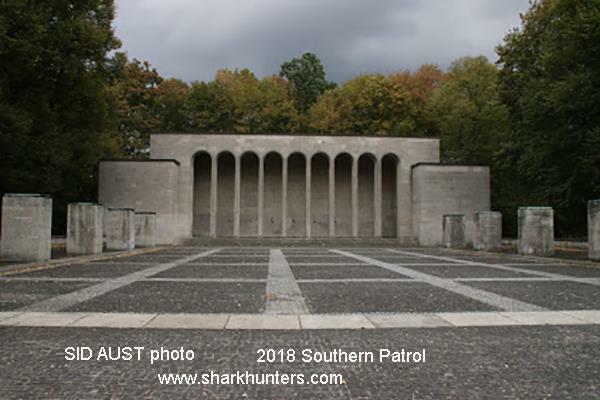 The Memorial where the “dead ceremony” took place during the Party Rallies when Adolf Hitler would touch the “Blood Flag” to the Flags of the other divisions. 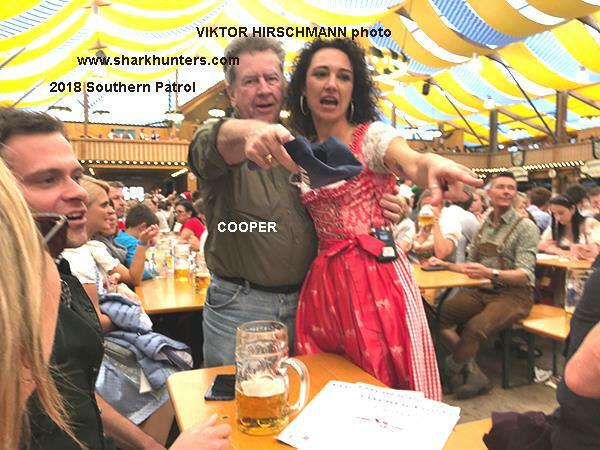 She lives in Nürnberg and was there on the Party Rally Grounds. 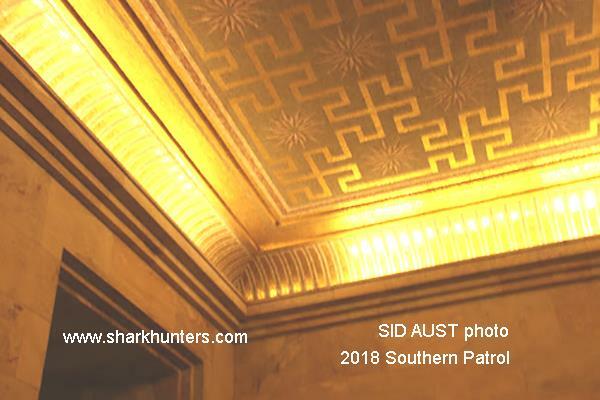 Inside in the ‘Golden Room’ off limits to all; but not Sharkhunters. 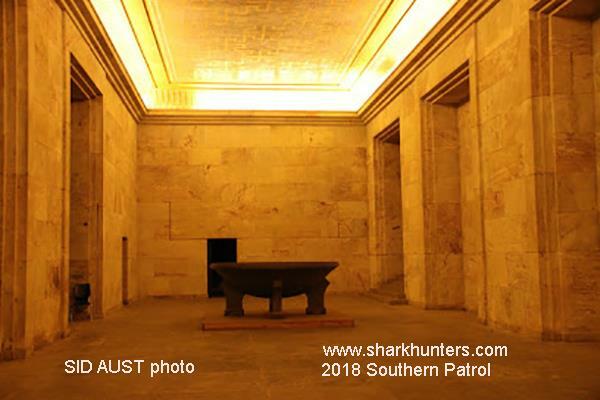 The huge brazier at the end of this room is one of the two that were on the opposite ends of the Tribunal with massive flames rising into the night during the rallies. Hitler would arrive by train at a station behind the rally grounds sometime prior to the speeches. It is now a restaurant where we enjoy a lunch. Then he would cross the 70 or 80 meters to the back of the tribunal and through a special door, would enter this room where dignitaries enjoyed refreshments etc. before Hitler would walk up the staircases and appear before the masses through the huge bronze doors that only he could use. 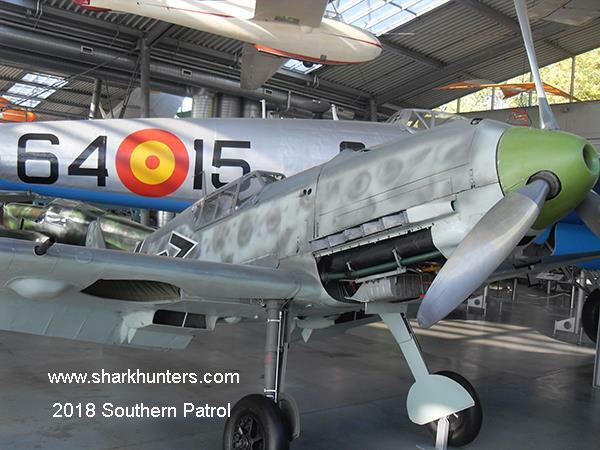 The Bf 109 (Me 109) was one of the most heavily produced fighter planes the world has ever known and they ruled the skies from the onset of the Spanish Civil War until midway through the Second World War. 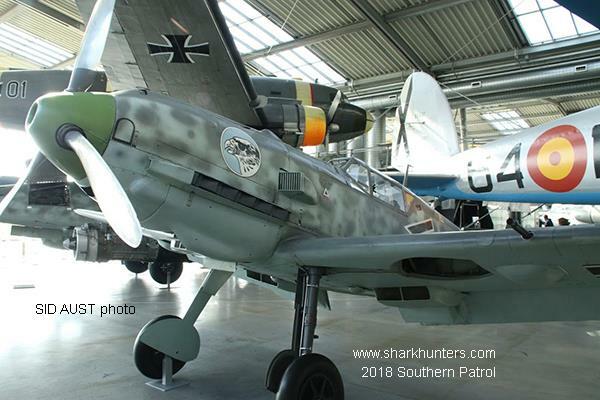 To look at photos is great, but to stand next to one of these magnificent warbirds will take your breath away! Join us next time. 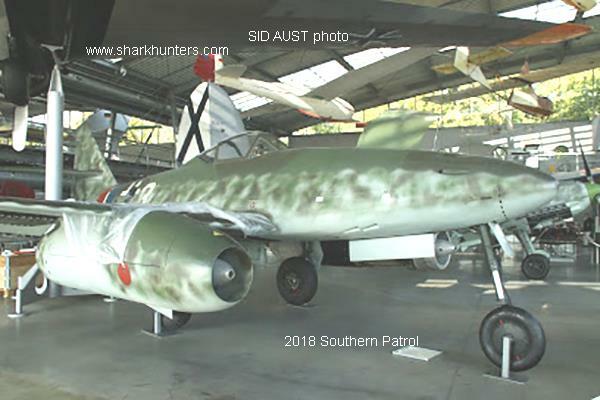 Another magnificent warbird is this Me 262 jet fighter – the first ever jet fighter produced in quantity and used in combat. 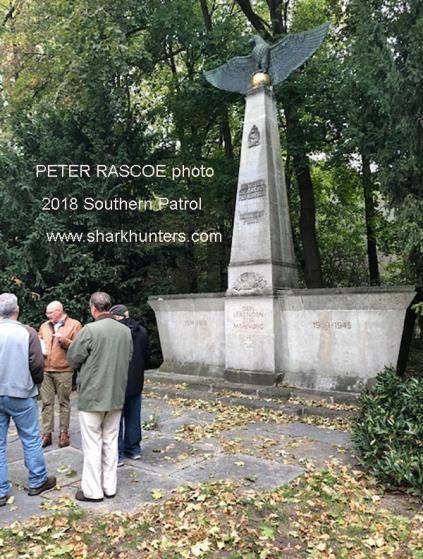 One of our Members who flew them in combat, ADOLF GALLAND, Member #2854, told us that ‘it was if the bombers were hanging on strings as he blasted through them at will, feeling as if he were being pushed by angels’. Standing within mere feet of these great planes gets your heart really pumping as we remember the great pilots of all sides in that conflict. 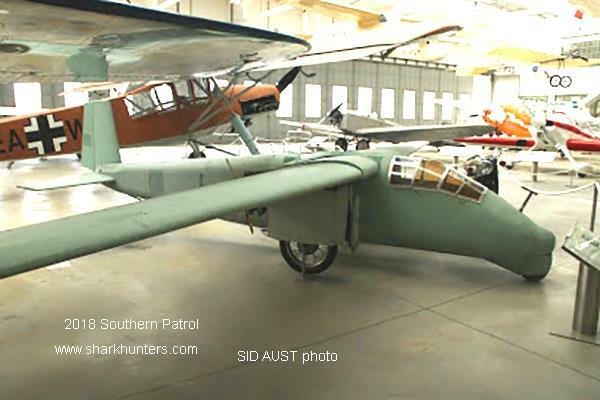 A failed escape – this really unusual aircraft was handmade in East Berlin by a man who intended to fly with his wife and three children to freedom in West Berlin. On the day before their planned escape, they were arrested for the crime of – trying to escape. 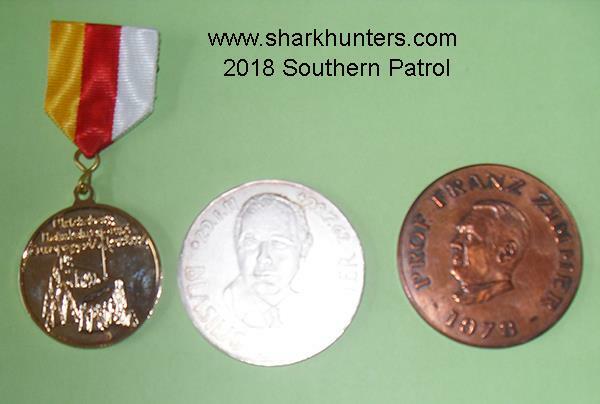 We asked participants in this, our 2018 Southern Patrol, for their comments. Sergeant Major LARRY KAGAN, Member #5053 has been on previous Patrols with us and he has this to tell us about his experience. You are now at home and can almost – I said ALMOST – cry at the good time you had knowing that some can try to imitate but none can duplicate. 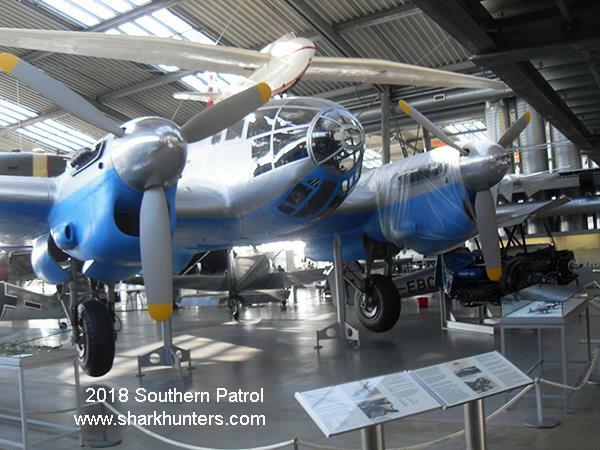 This Heinkel He 111 bomber is in great condition and some of our Members including Baron GEORG von ZIRK, Member #3290 served aboard these beautiful planes. No, we do not endorse war and we believe that war is a terrible thing. It has been said that wars do not determine who is right – only who is left and further, wars do not solve problems – they merely determine which group of politicians gets to tackle the problems. That does not mean, however, that we cannot remember and honor the tens of thousands who fought so bravely and honorably on all sides. One side won, the other lost but that does not mean that one side was good and the other evil – not at all. 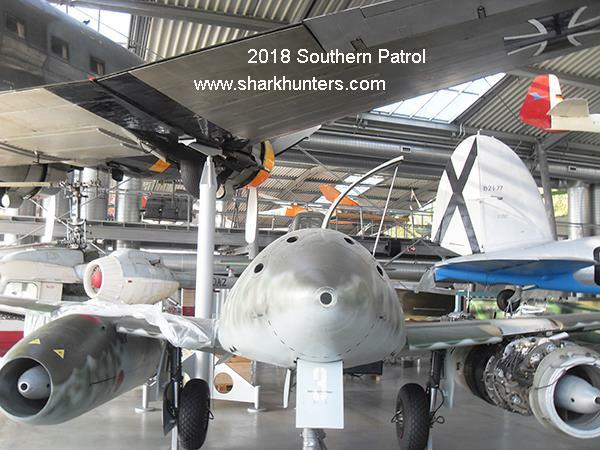 This museum contained a great many aircraft including these of the Soviet Union. Left is a two-seat MiG-15 trainer and on the right is a MiG-21, a fast interceptor but with a limited range so they only went after the American fighter-bombers and did not mix it up with the American fighters. US Air Force Colonel Robin Olds used trickery to lure the North Koreans into committing their small number of MiG-21 interceptors into combat with what they thought were American fighter-bombers, only to realize too late that they were suckered into a fight they could not win with American fighters. They lost half their MiG-21 interceptors in a single engagement. These photos are great, but you can actually walk along with us in these museums and other places. Just click here to watch! 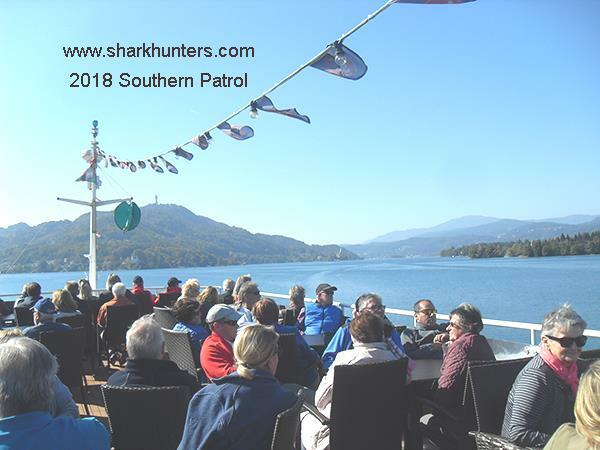 There are a great many very short video clips that will give you a much better idea of what we did and saw …and maybe next year, you will come aboard a Sharkhunters Patrol. You won’t regret it. 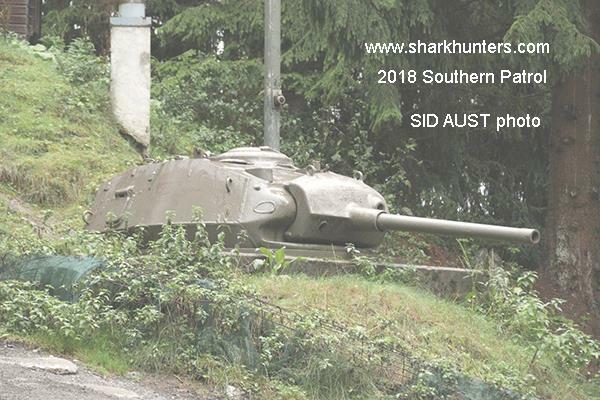 SID AUST, Member #5438 has been on Patrol with us a few times before and he is a photographer and he put this clip together for us. Click here and experience what we enjoyed for two weeks. PURE BU##S&IT! 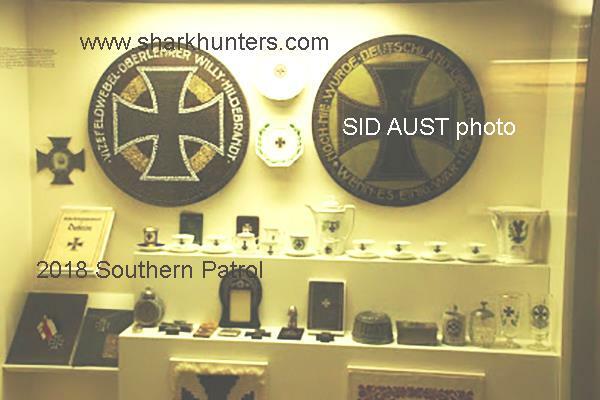 – Okay, we know that Adolf Hitler, Eva Braun and thousands of others who fled the crumbled 3rd Reich went to South America, most notably they fled into Argentina. Anyone who reads our books and sees all the hard evidence and still does not see that this happened is pretty dumb. Proof is one thing, but deliberate falsification to attempt to prove something is absolutely wrong and cannot be condoned. 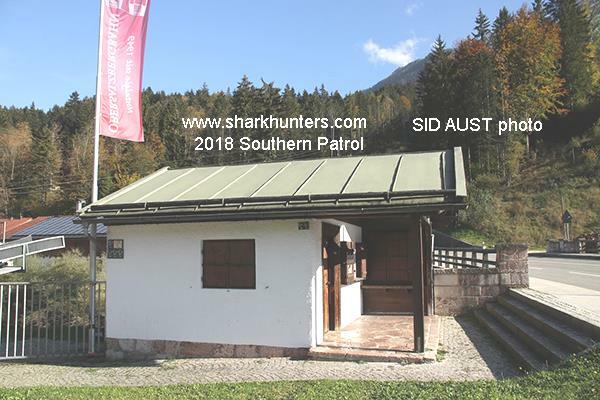 We reported some time ago that the Park Rangers at the ruins of the safe house (not Hitler’s house as claimed on History) told us that the film crew salted the area with 3rd Reich coins and pill bottles. INEXCUSEABLE! And now some clown has popped up on the Internet with a badly Photoshopped photo of Hitler and Eva Braun standing in front of Inalco in a pose somewhat reminiscent of the famous painting “American Gothic” by Grant Wood. It is TOTALLY FAKE! OKTOBERFEST! 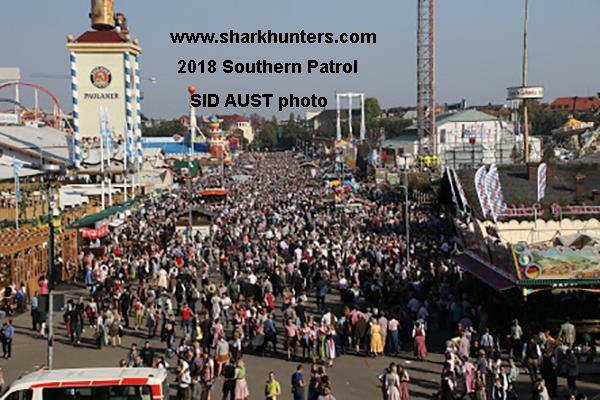 The world’s biggest outdoor party and Sharkhunters are there! Can you see yourself in this happy throng of revelers from around the world? 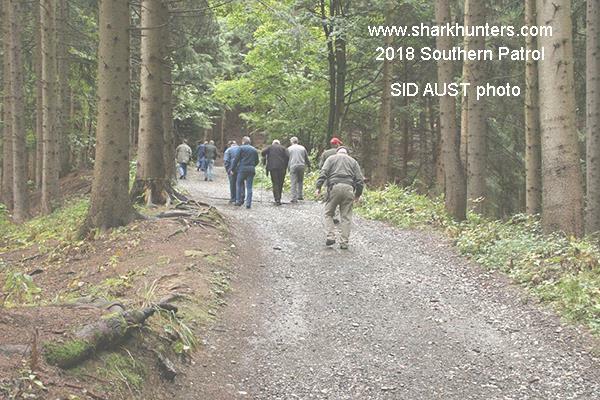 Members on this Patrol sure did, and we had a fantastic time! 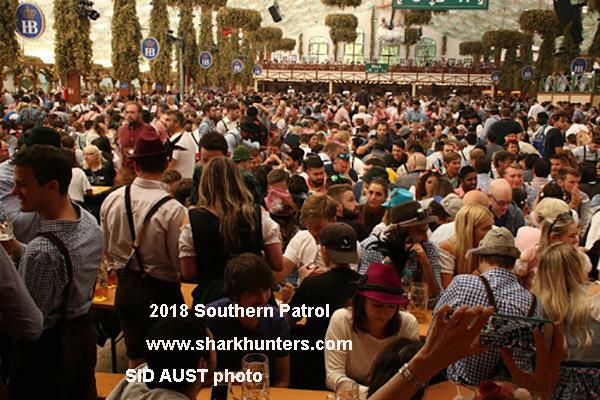 You can put yourself in this picture too …join our newly designed Patrol to Bavaria and Oktoberfest in 2019. 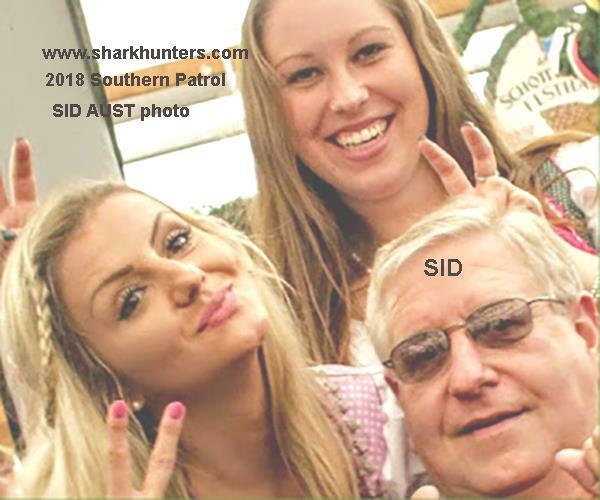 SID AUST, Member #5438 has been with us on several previous Patrols and we thought he kept returning because he loved the Patrols. Now it appears he has other reasons for returning. 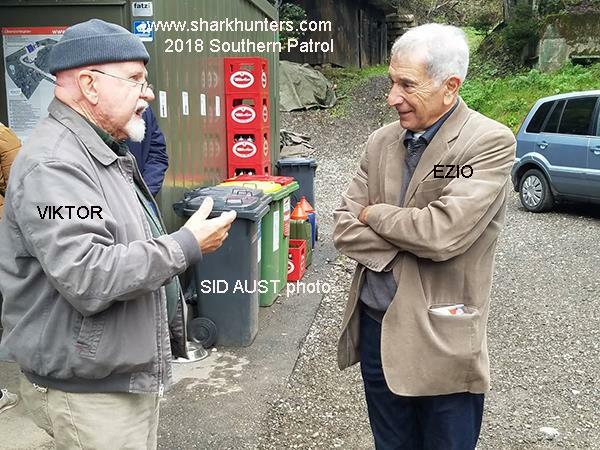 Just kidding – SID is a great guy, a superb photographer and he does keep signing on our Patrols because they are so great. After finishing her performance onstage, the star attraction came to our table where she and I are singing “Delilah” along with the hundreds in the beer tent. She has a beautiful voice and sounded great. As for me – Tom Jones doesn’t need to worry. 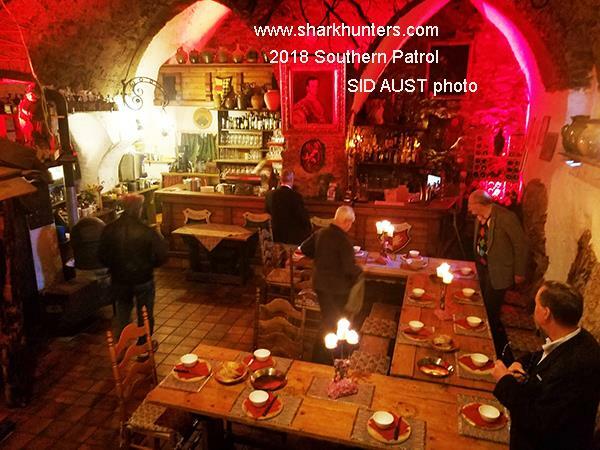 We always eat well on our Sharkhunters Patrols and here at Oktoberfest is no exception as we look at one of my favorite German dishes – schweinebraten! 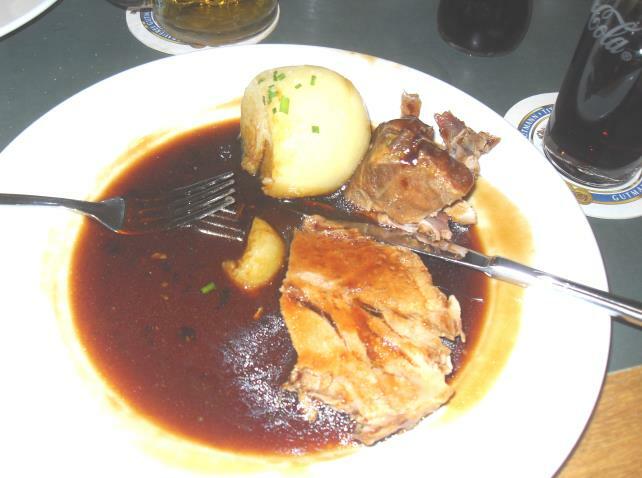 This is seasoned pork in a scrumptious dark gravy with the potato dumpling. YUM! 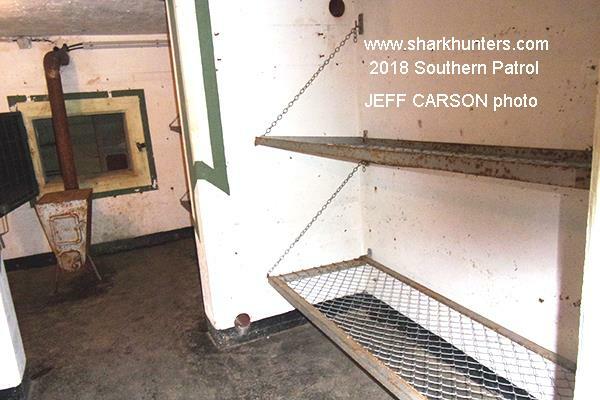 Start saving your spare change and your vacation days – Sharkhunters are planning some really interesting Patrols for 2019 and you can be part of this history. You will be transported through the tunnels of time to another era. You will love it! The Tribunal at Zeppelnfeld, the place of the Party Rallies where speeches were made in front of hundreds of thousands. 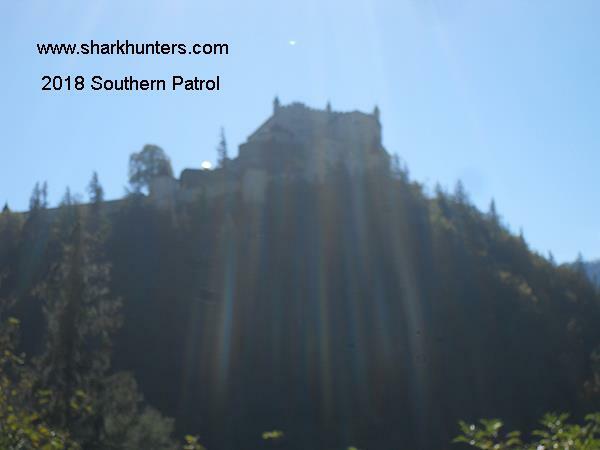 The scenery is breathtaking – and we are told that this castle was in the movie “Where Eagles Dared”. 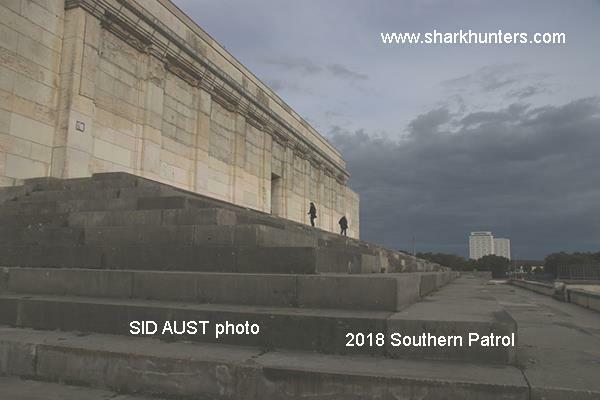 Come with us in 2019 and shoot your own photos. You’ll love it! A live dragon? In Klagenfurt? Here in Austria? Locals tell us that this dragon once was alive. 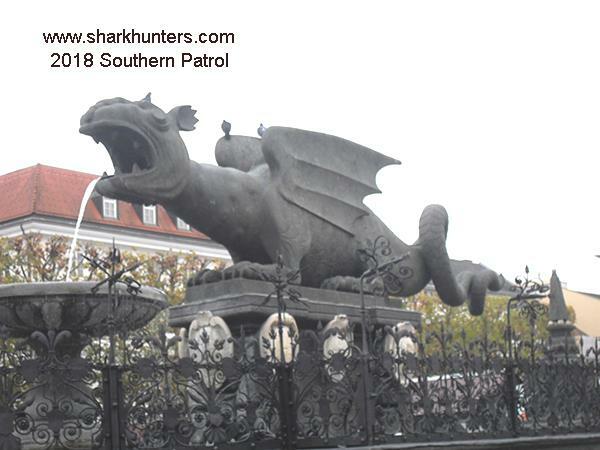 They say it roamed all over Europe in old medieval times but this dragon could only eat virgins and when it got to Klagenfurt, the poor thing just up and starved to death! 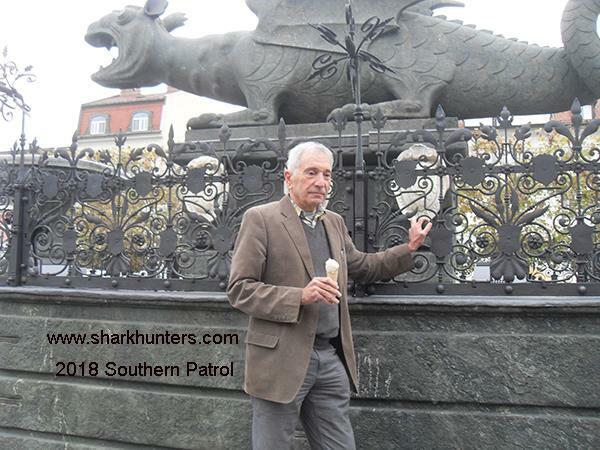 EZIO MAIOLINI, Member #7226 is showing his sympathy for the poor beast by eating an ice cream cone. 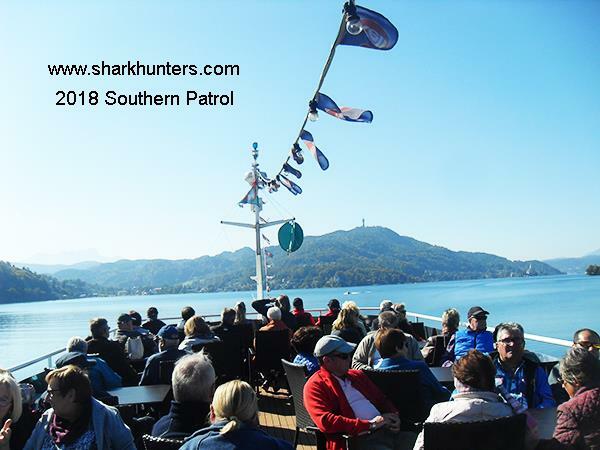 The day was so great we enjoyed a three-hour cruise on the beautiful Wörthersee on a boat with three decks. Here we are on the uppermost deck enjoying the sunshine. This house was used to film a European reality series. People come from hundreds of miles to be married in this old church. SID AUST, Member #5438 has been with us on several previous Patrols and we thought he kept returning because he loved the Patrols. Now it appears he has other reasons for returning. 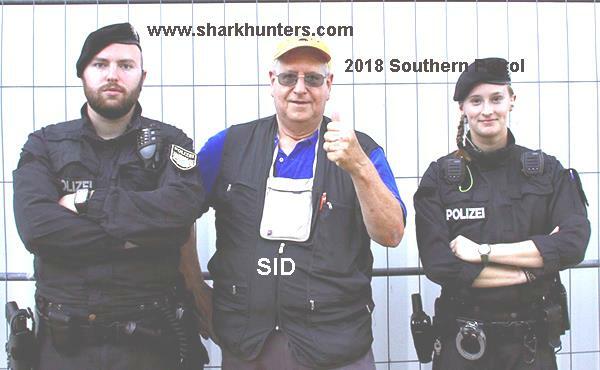 Just kidding – SID is a great guy; a superb photographer and he does keep signing on our Patrols because they are so great. Before we departed for the Marine Kameradschaft, I paused to look at this beautiful Harley. Martina owns this hotel and has been a good friend for many years. I used to ride Harleys too – but not like Martina. What a rocket! She flies!!! Our friend KARL-HEINZ FISTER, Member #7729 welcomes our group to the MK (the Navy League) for the special afternoon they prepared for us. 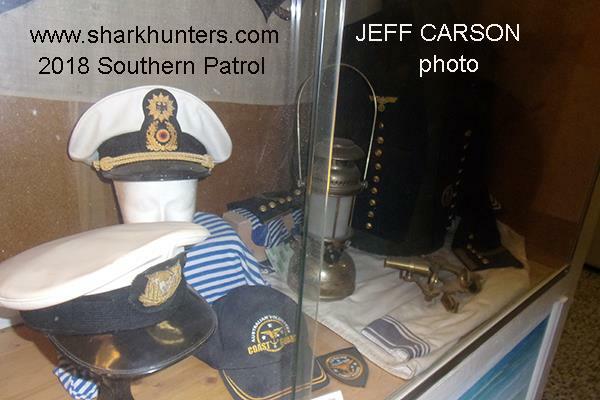 K-H spent many decades at sea as Chief Engineer on many freighters. Above and previous 4 pictures: Scenes inside the MK headquarters in Klagenfurt. Very high honors from the MK to Cooper. 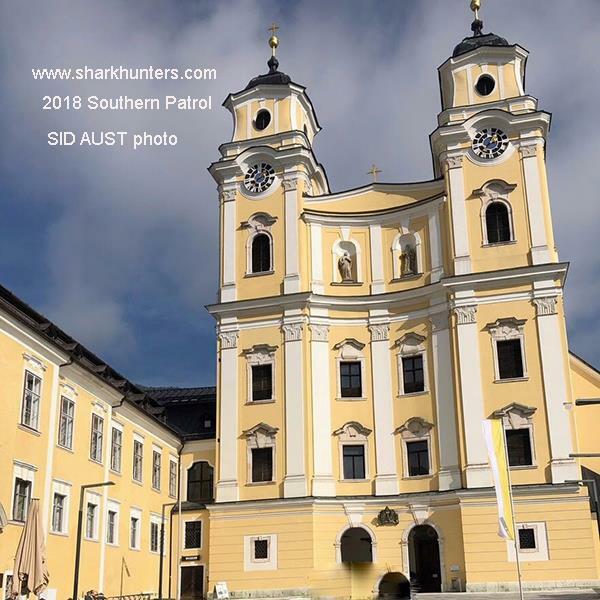 This is a beautiful facility and it is headquarters for the Marine Kameradschaft (the Navy League more or less) here in Klagenfurt, let us make a comparison. 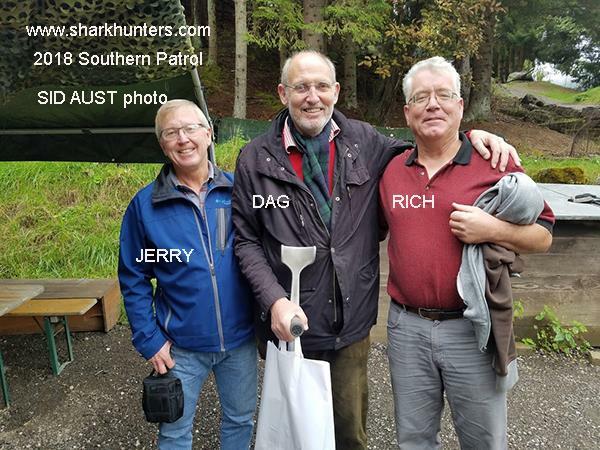 We veterans of the American forces, British forces etc. usually have really nice headquarters and in the US at least, the American Legion and Veterans of Foreign Wars posts have flags flying, a big sign that says which Post they are and has some bit of memorabilia out front. In this area, the VFW post has a Huey helicopter. 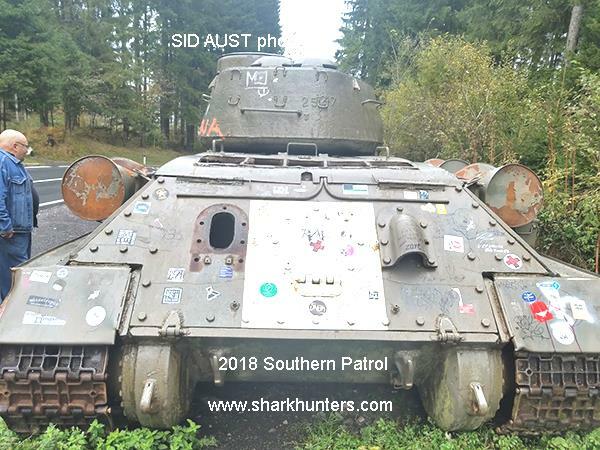 Other posts have anti-tank guns, tanks, field artillery pieces – something to designate their existence. 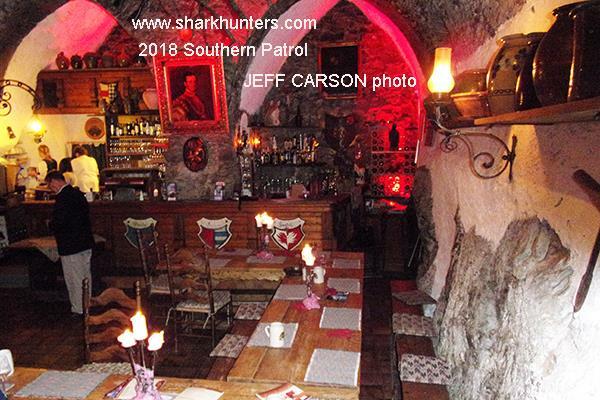 On this day, we enjoyed a super dinner in an ancient castle. 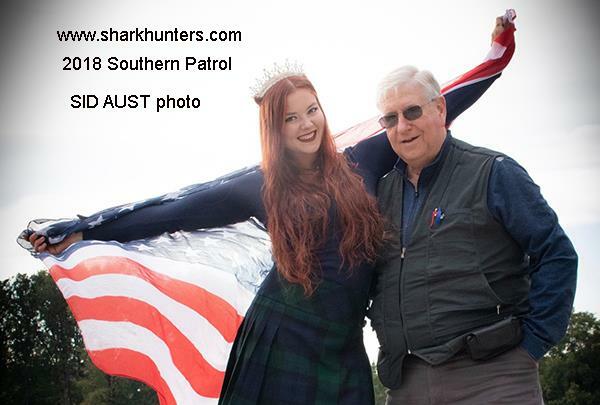 The video of our ‘performance’ will be posted on our Sharkhunters YouTube Channel soon. Let your mind wander back many centuries and join us in the days of kings and dragons. 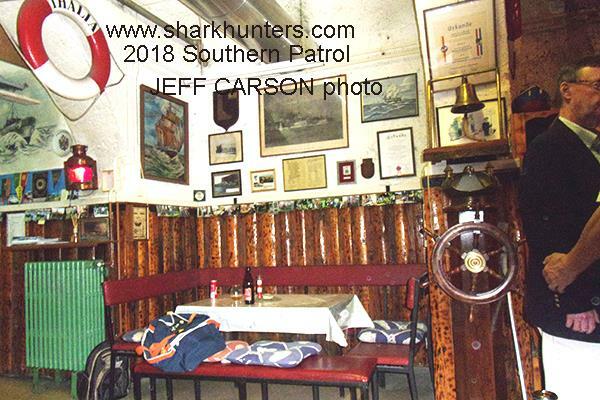 A view of our feast room. Another view of our feast room. 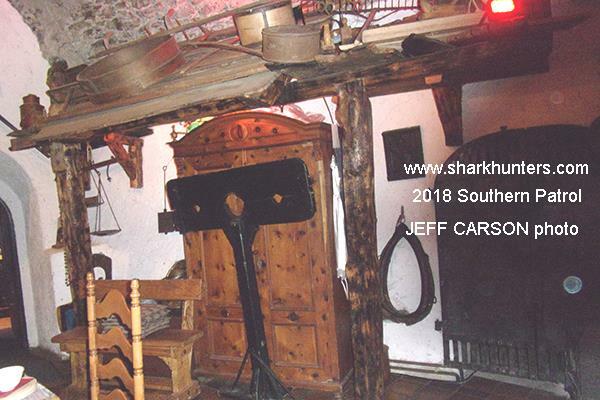 The stocks and punishment devices for lawbreakers. In our pre-dinner performance, the Sinner (VIKTOR HIRSCHMANN #6773-LIFE) was sentenced by the Judge (LARRY KAGAN #5053) to be put in the stocks and flogged for his sins. 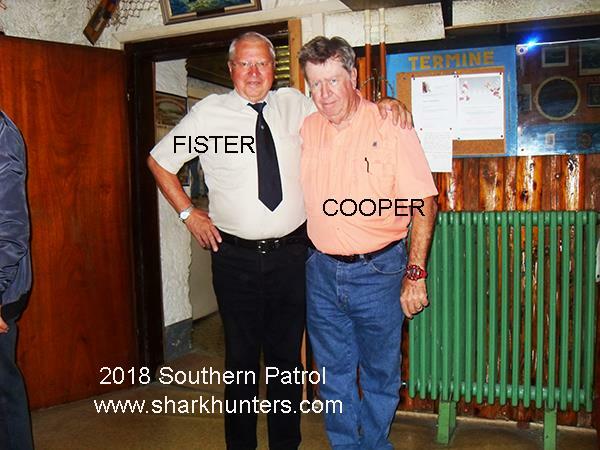 The Priest (PETER RASCOE, #7818) asked for forgiveness so the King (HARRY COOPER #1-LIFE) commuted his sentence and knighted him. Meanwhile, the Court Jester (JERRY HORNER #8213) kept the group amused. Then the Knight had to slay the Evil Ogre (DAG TESSEM #8009). Goodness and virtue won out that day and the Knight slew the Evil Ogre, so the King gave the Virgin Princess (KRISTIE HERNANDEZ #7799) to the Knight as his bride…..then we all ate great food as in medieval days. It was great fun and the video will be posted soon. 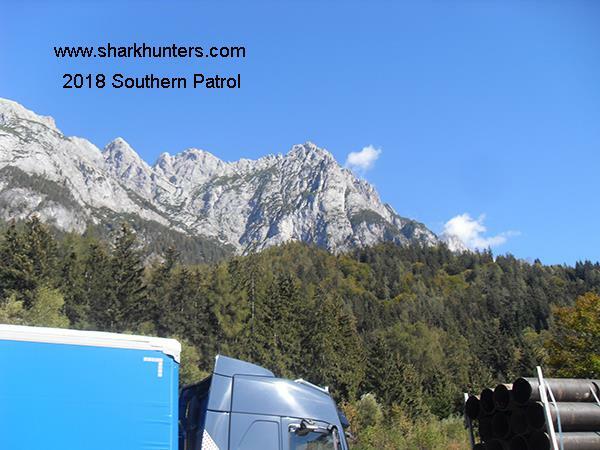 On our way to the former NATO bunker compound, we ducked over the border into Slovenia for a moment. 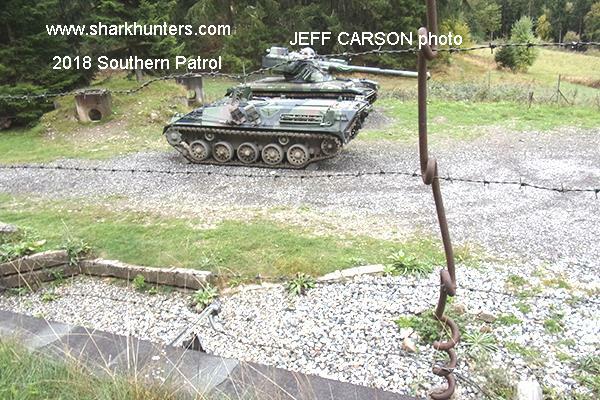 Sergeant Major LARRY KAGAN, #5053 (US Army, Ret) has never seen a tank in such a sorry state of repair. 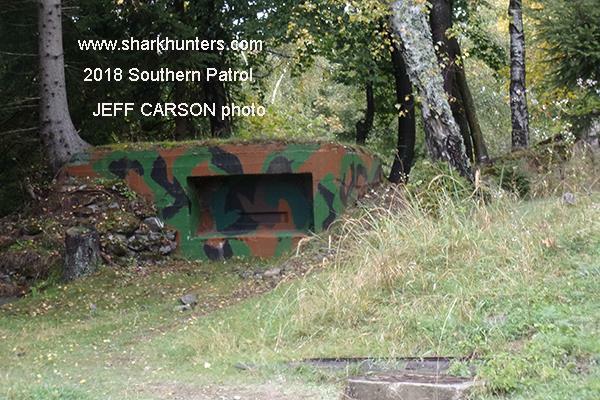 Back in Austria, we head toward this bunker compound that was one of about fifty along the border between East and West – the Soviet Frontier was nearby and this bunker line was to combat any attack by the Soviet Union. 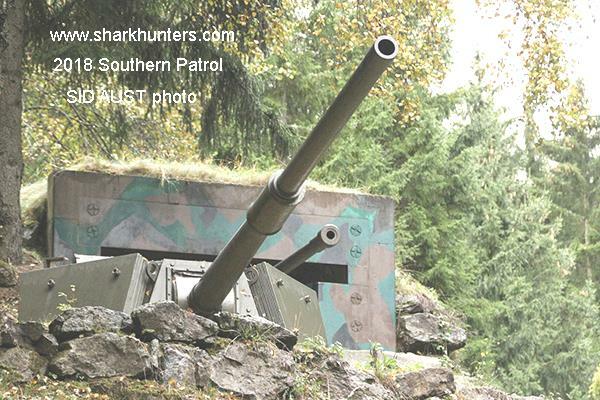 Of course, the Soviet Union had a matching line of weaponry in case the NATO forces decided to attack them. 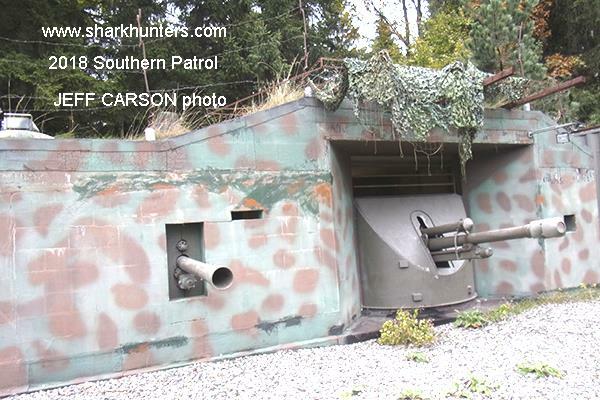 This is the only one of these bunker compounds remaining. 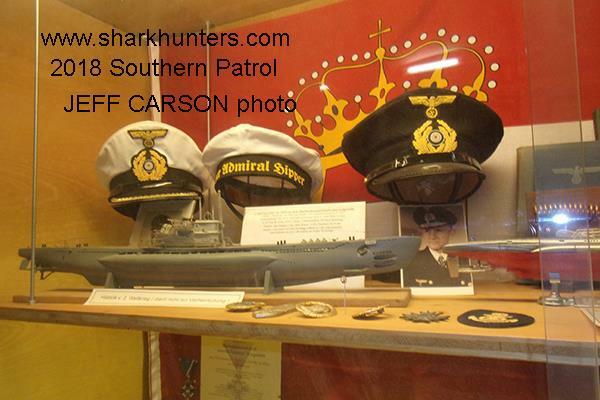 It was bought by the former commander to be preserved as a memory of the Cold War and we are there. There are miles underground, and we head into the nearest entrance. Down, down, down we go into this maze of tunnels, gunports etc. 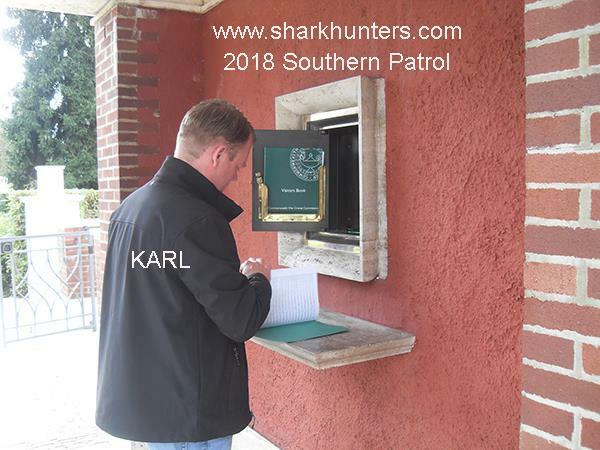 Put yourself in these photos; join us for our new and reworked Patrol in 2019. 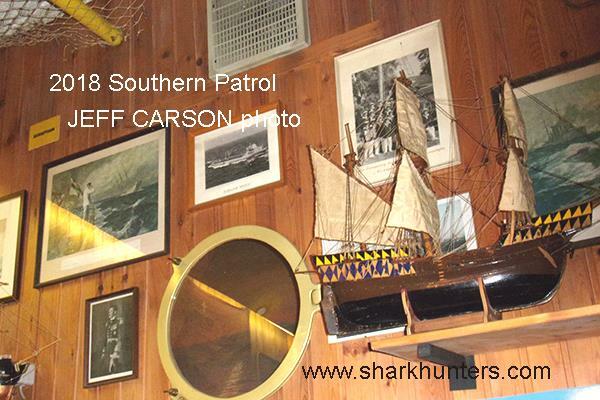 Sharkhunters Patrols are great for making new friends interested in this history. We stopped to pay our respects at the only British war cemetery in Austria. As we have previously said – these are names on chiseled headstones and written in the cemetery locater – but they are also young men who will never grow old, will never have children or if they had, will never watch them grow… attend their first-grade play, dance recital, teach them to drive. They also represent the devastated parents who will have an empty seat at the Thanksgiving table and a terrible hole in their heart and a pain that never goes away. May God bless all who served honorably and those who fell in battle – all branches and from all nations. 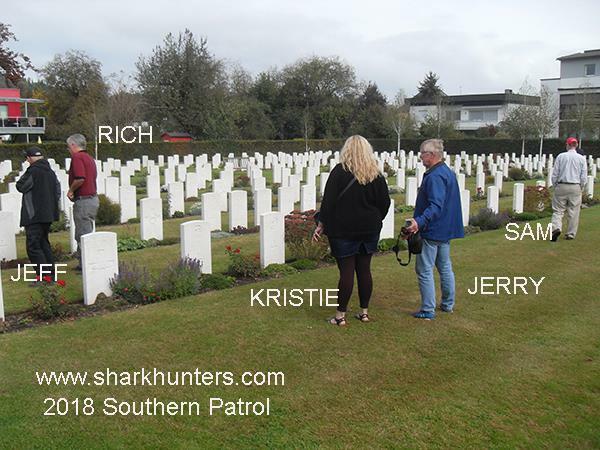 At Sharkhunters, we honor them all. After a certain point in World War Two, the Luftwaffe had pretty much lost control of the skies and German factories were being bombed to smithereens so, in an effort to keep up their war production, factories were moved underground. It has been estimated that, for everything Germany built above ground, they built FOUR TIMES as much underground. We visit one of these huge factory complexes at Ebensee. There is even a train in one of these tunnels… not a gold train; sorry. 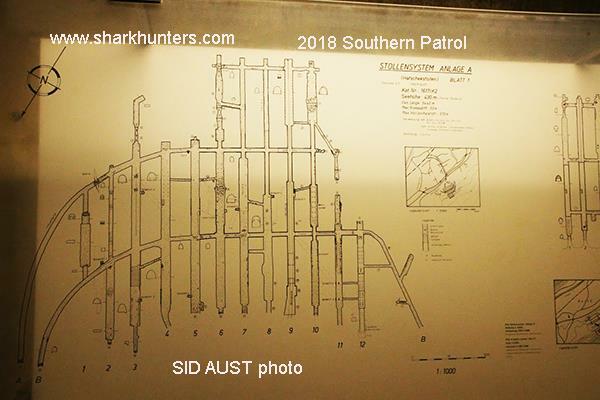 This is the plan of just this one underground factory and we concentrate on tunnel #5. 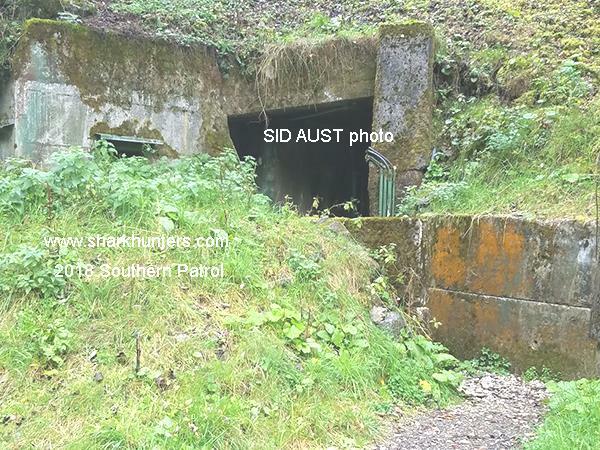 Myth #1 – All the German tunnels and bunkers were filled with gold, jewels, stolen art etc. That is FALSE. 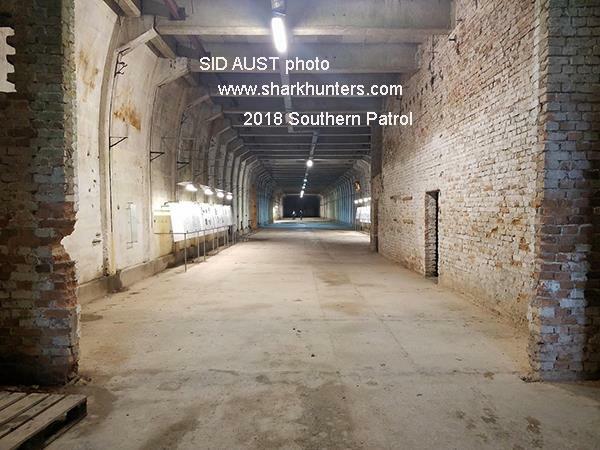 Almost all these tunnels and bunker systems were underground factories for building anything and everything that would have been built in an above-ground factory – things like this factory that built various parts for trucks and tanks such as brakes and brake components. Some even built airplanes inside mountains. 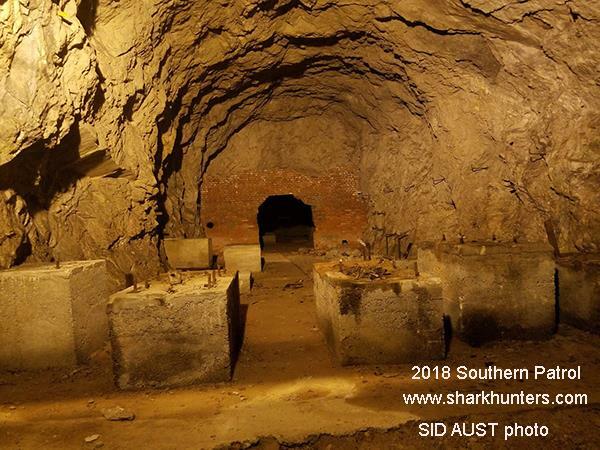 While there were a handful of underground storage facilities for treasures, the vast majority were manufacturing and air raid bomb shelters. 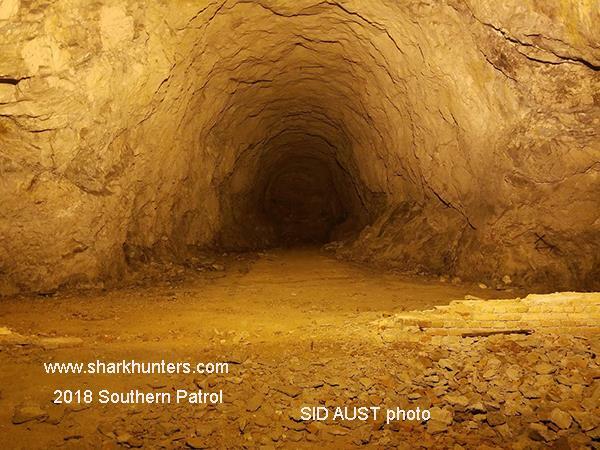 Myth #2 – All these tunnels were built entirely with slave labor. While some of the manual labor may have been done this way, the engineering, blasting, construction etc. was performed by highly trained specialists. 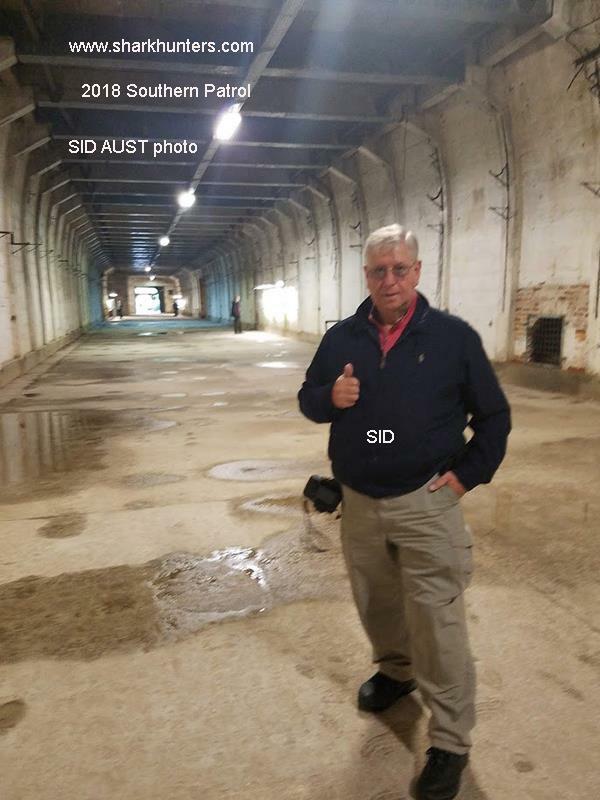 Interesting note – the inside walls of these tunnels are NOT the walls of the mountain. 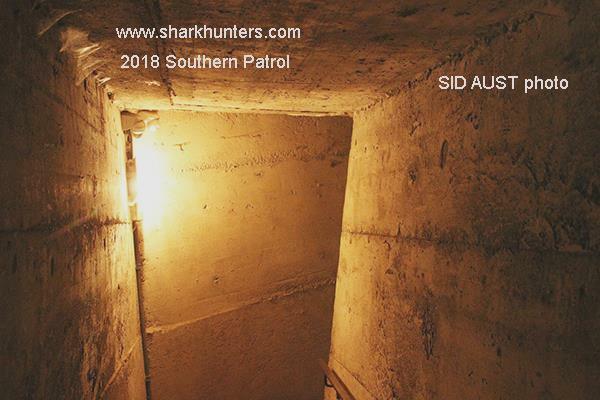 There is a gap of about one foot between the walls of the mountain and the constructed walls of the tunnels. That is to allow for the shifting of the mountains without impacting the structural integrity of the tunnels. LIf you look closely, you will see numbers on the walls between the supporting ribs. In true German precision, if a delivery of parts was to be delivered a specific machine, it would go to “L86” or “R57” meaning Left or Right (Links oder Recht) then the number so everything got to the correct machine. Clever, eh? I convinced our guide to unlock the gate into the other parts of this compound and some of us went, on our own, into the depths of history! You could too – join us. This appears to be where the diesel engines were mounted to supply electric power. Did you see the movie “The Sound of Music”? just about everyone has and so you will recognize this beautiful church. 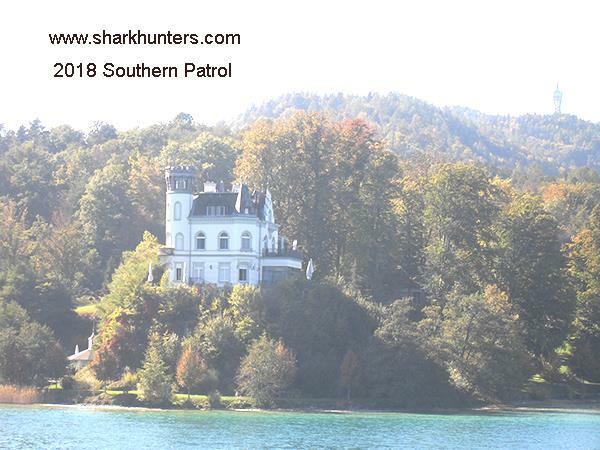 It was here the wedding scene was filmed on the shores of Mondsee (Moon Lake). 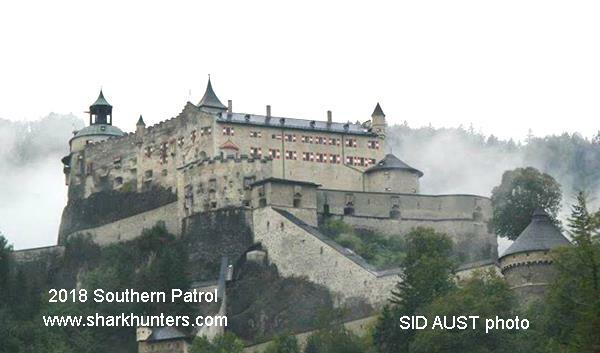 During WW II this was a restricted area for Waffen SS only. 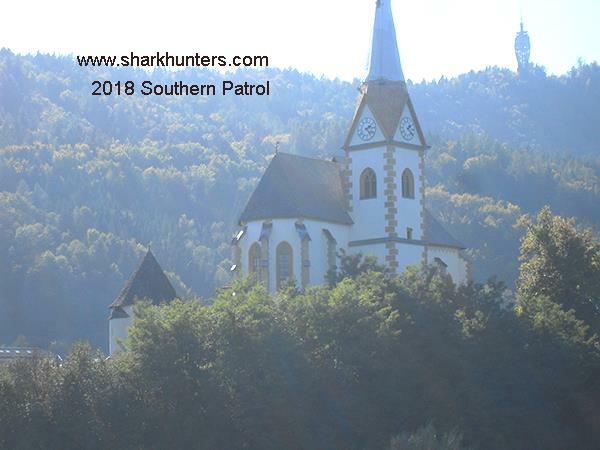 During the war, this area was set aside for the Waffen SS for rest, recuperation, there were clinics and hospital facilities in this small valley. This is yet another example of the incredible beauty of this part of the world. We will be back here in 2019 and you are invited to join us. Full details coming very soon. We reluctantly said goodbye to Austria and headed just over the border into Bavaria of Germany; also fantastically beautiful and with massive amounts of history. 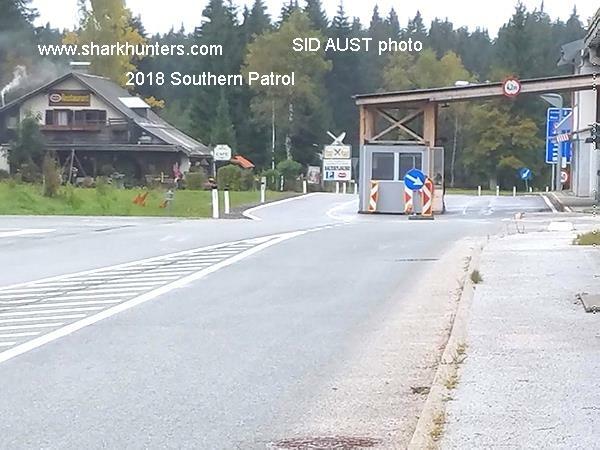 In Berchtesgaden, there was a huge 3rd Reich presence, primarily on Obersalzberg, the mountain where there were homes for Hitler, Bormann, Göring, Speer and many others. 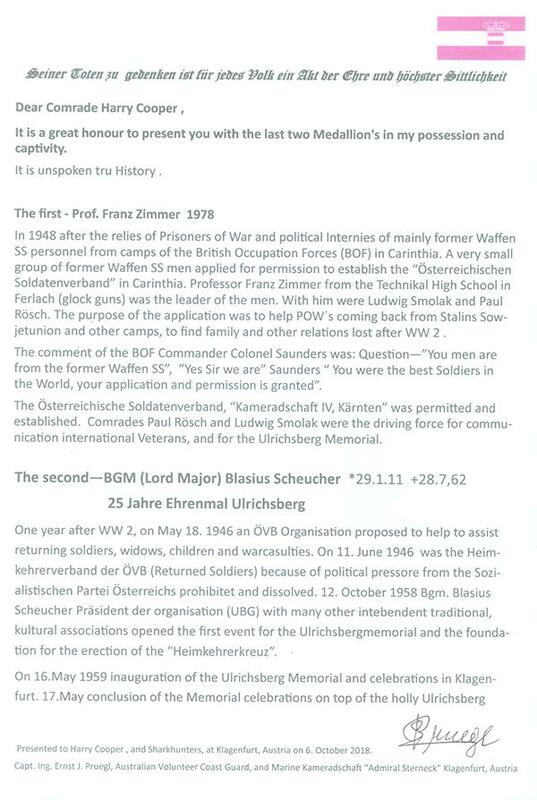 There were several farms, operated under control of Martin Bormann, where all the food was grown, the milk produced, the animals such as pigs, chickens, cattle etc. that would feed the hundreds of people on the mountain. Each one of these high-level men had a large staff on hand as well and they had to be fed, housed etc. 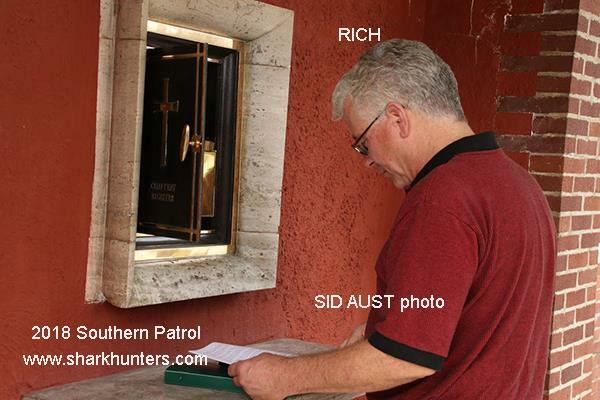 and so the security was tight and got tighter as one went up the mountain. This is the first of the sentry posts. It is at the foot of the mountain and if you look closely, you will see the bridge on the right that goes over a very fast rushing stream. 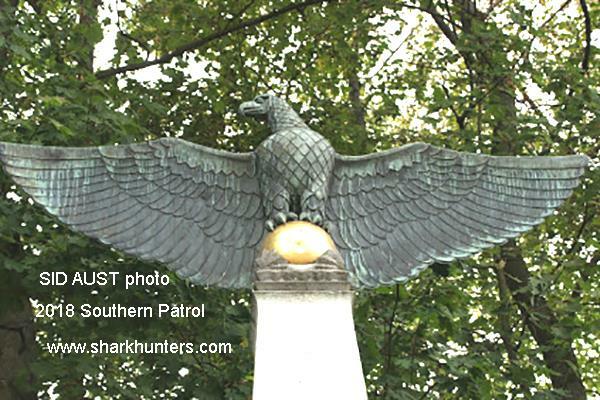 It was at this first sentry post that one had to present their papers to continue up the mountain. As one would go higher and higher up the mountain, there were more and more sentry posts and the security tighter and tighter.